Today has been all about getting ready for the zine symposium. I picked up some zines from the printers and have been making signs, stapling zines and gathering everything pretty much all day. I have a couple new things I am excited about. 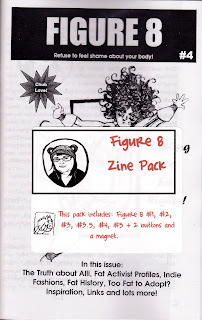 I will be selling Figure 8 zine packs at the symposium for the first time. I made labels and everything. I love doing crap like that. I am really pleased at how good it looks together. These of course include the new issue of Figure 8 which I will post later. I will get these in the shop early next week. I also got a chance last night to make something I have been wanting to make for about a year. A while ago when I was making some copies of Imaginary Life #3 and I was thinking about how pretty it was in color and it was ashame people couldn't see it that way. 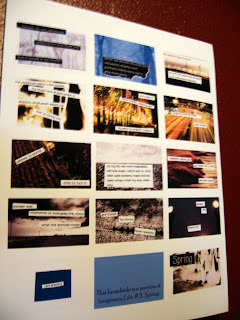 I have always liked the flow of the words in that zine and have thought them to be pretty universal. So, I decided to make a zine broadsheet. A broadsheet is a word used for many different kind of printed papers, but I am thinking mainly of the poetry broadsheets made most often in the 60's and 80's. These were posters with poems on them, often illustrated. 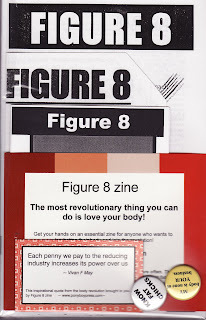 So, this is a zine broadsheet. This is something that is meant to be hung on the wall or tacked up on a corkboard. I am really happy with how they turned out. Here are a couple pics. It was hard to get a good image without natural light, but you get the idea. These will be added to the shop soon too. Should I mat them? Do you think people would want them already matted or is plain good? I really wish the synchronized swimming or ribbon gymnastics were on the Olympics tonight. I saw a couple of the ribbon ladies today and they were awesome! Okay, well off to do more work. Hope you have a good weekend. Come by if you are in Portland.